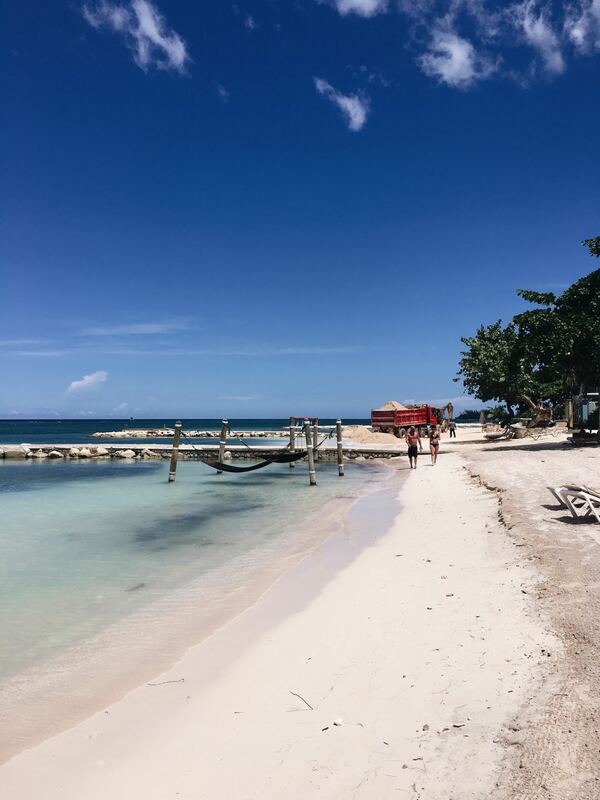 I have a VERY exciting travel post to share with you all today – all about my recent trip to the gorgeous island of Jamaica!!!!! I know right – JAMAICAAAA. I was invited to Jamaica by the fabulous Sandals Resorts and I can’t even explain the level of excitement I had when I got the email asking if I wanted to go? Did I want to go – ermmm YES PLEASE. This was one of those ‘pinch me’ moments – is this really my job? Have I really just been invited to Jamaica for week to stay in a luxury resort with all-inclusive food and drinks?! Are you sure you mean to email me? Yeah but like 100% sure? I couldn’t believe that not only had I been invited to spend the week at Sandals, but they had also invited my boyfriend to come along too. I have never seen him so pleased that that blogging was my job. I think that this is probably the only thing that has made the “can you just take another photo of me” lifestyle worth it. 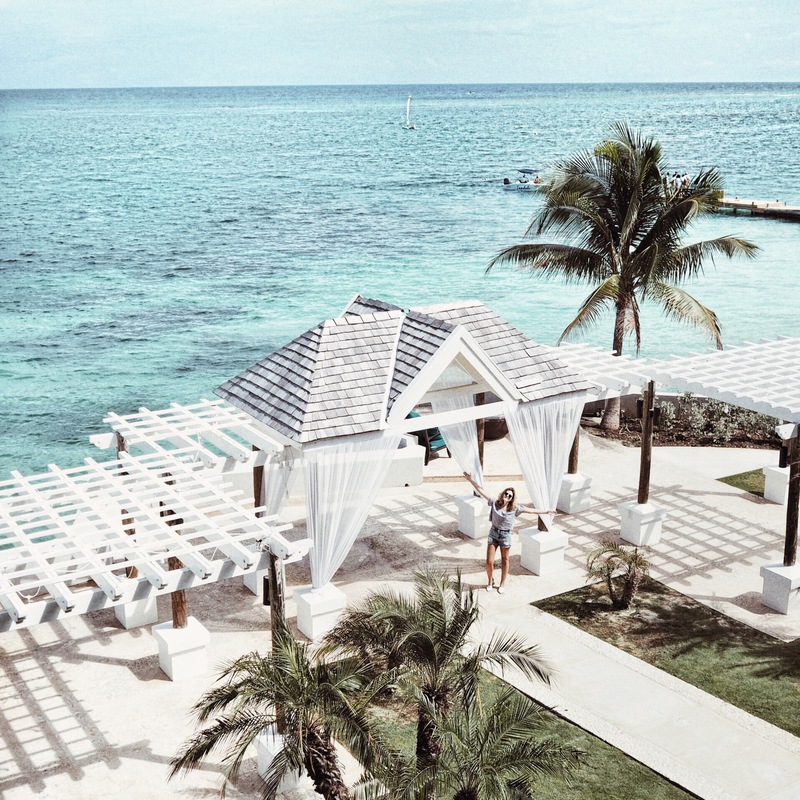 So – we packed our bags (Alex- lightly, me- cramming everything I own into a bag and praying it wasn’t over the weight limit) and we jetted off to Jamaica. The flight wasn’t actually too bad – but then again I LOVE long plane journeys. I hate short flights, because they always feel way more bumpy and more “oh my god I am going to fall out of the sky”. But I do love a long-haul flight, settle down to binge watch movies you probably would never make the time for in normal life – but up in the air you think “Yes – I will watch Baywatch and Lego Batman”. The flight was 9 hours ish, and when we landed we were taken straight to our resort. I LOVE the Caribbean. It is somewhere I have always wanted to explore more. I have been to Barbados before, but never explored any of the other islands – so I was SO excited to head to Jamaica – and try and ‘run’ into Usain Bolt. So many puns intended. I had heard such incredible things about Sandals. Alex’s parents have been to two different Sandals resorts and their photos and stories of their trips are amazing, so we were SO SO SO excited to try out the Sandals experience for ourself. It is all about luxury and all-inclusive (I actually think that their tag line on their website is ‘Luxury Included”). I don’t know about you but anywhere that specialises in having unlimited food surrounded in luxury is OK by me. When we arrived, we were met by the PR for the hotel, Khadine, who was so lovely – checked us in, handed us a cocktails and booked us in for a massage, so we were in HEAVEN. 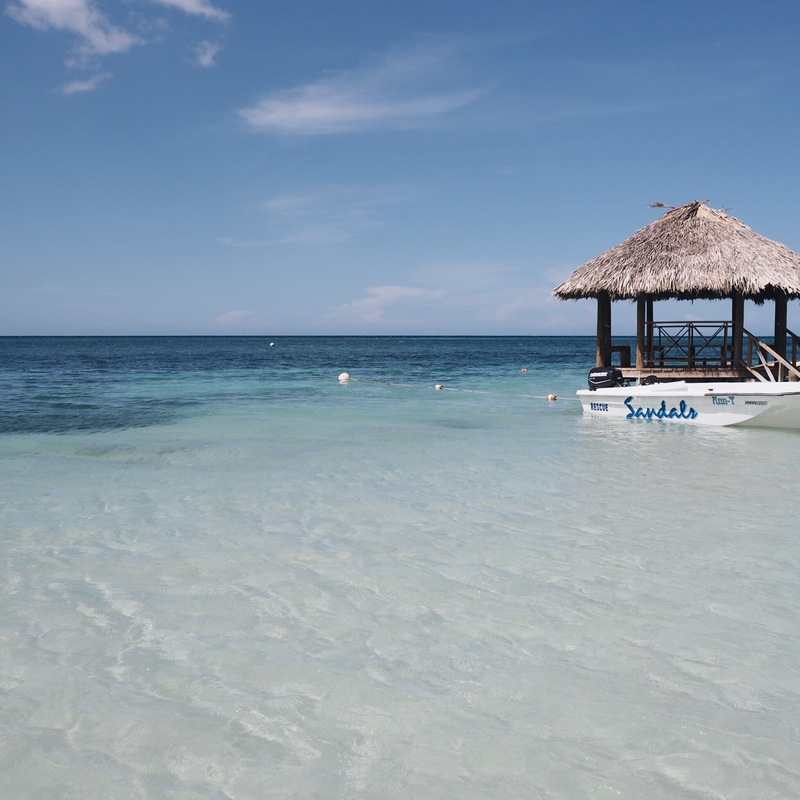 We were staying at Sandals Montego Bay resort first (we then headed down the road to Sandals Royal Caribbean but more on that resort in a bit!). 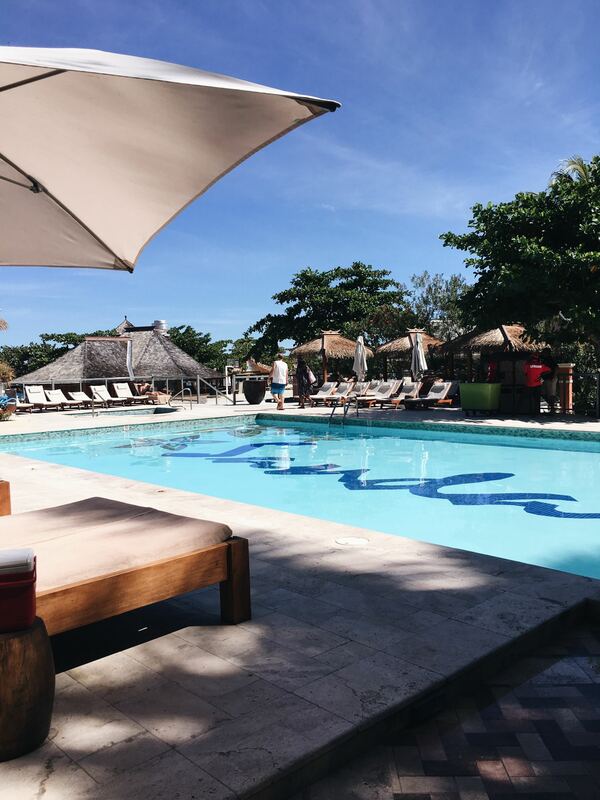 Montego Bay is the Sandals flagship resort and their first ever resort – so I was so excited to see where it all started. The resort is set on the ‘best private white beach’ surrounded by Reef-Protected waters. There are two pools (on the website it does say there are 4 pools but we only saw 2), 9 restautaurants, and this resort has an option called “Stay at one, Play at three’. 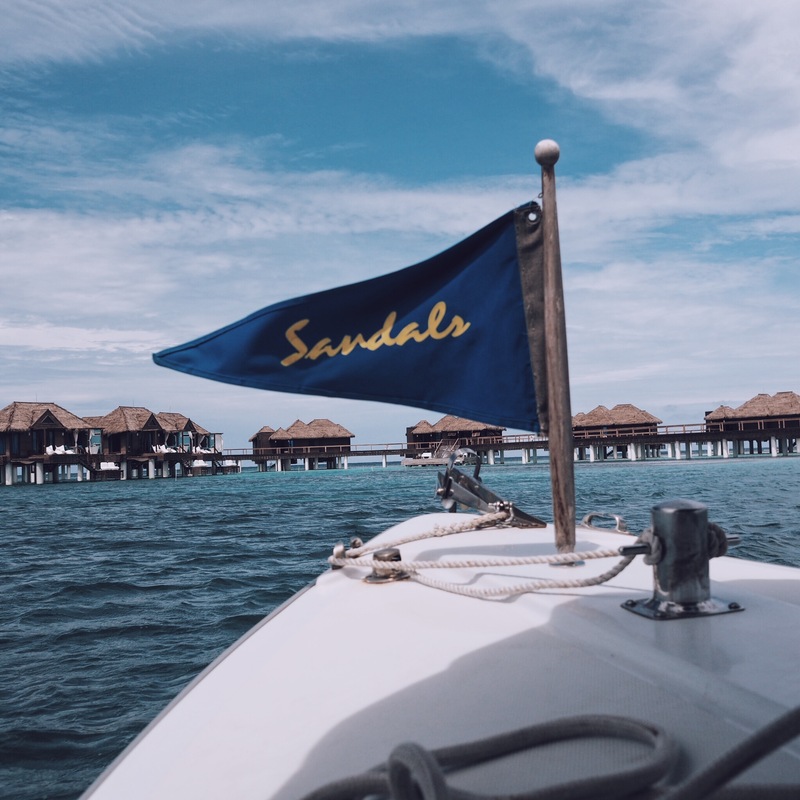 This means that if you stay at one Sandals resort – you can visit the other two closest Sandals resorts for free, plus you can dine there, use the facilities – which is AMAZING if you are looking for a change of scenery, or to just explore as many luxury resorts as possible. It also massively increases your number of available dining options – if 9 wasn’t enough for you! The beach at the resort is BEAUTIFUL, there are hammocks in the sea, some swings and a little hut which is Instagram heaven! There are also gorgeous little huts along the beach that you can reserve! As this is the first resort – it is currently undergoing some refreshments so there was a bit of building work going on along the beach and around the resort whilst we were there but I can’t wait to see what they are doing with the new buildings! Like all the Sandals resorts, there is unlimited water-sports & diving. Alex went waterskiing on the first day. And on his first try ever – he stood up perfectly and rode off into the sunset. He is annoying good at anything that is remotely ‘sporty’. Its really annoying as I never win at anything. Ever. But my favourite part of staying with Sandals – is the unlimited food and drinks – so lets get onto that bit shall we? 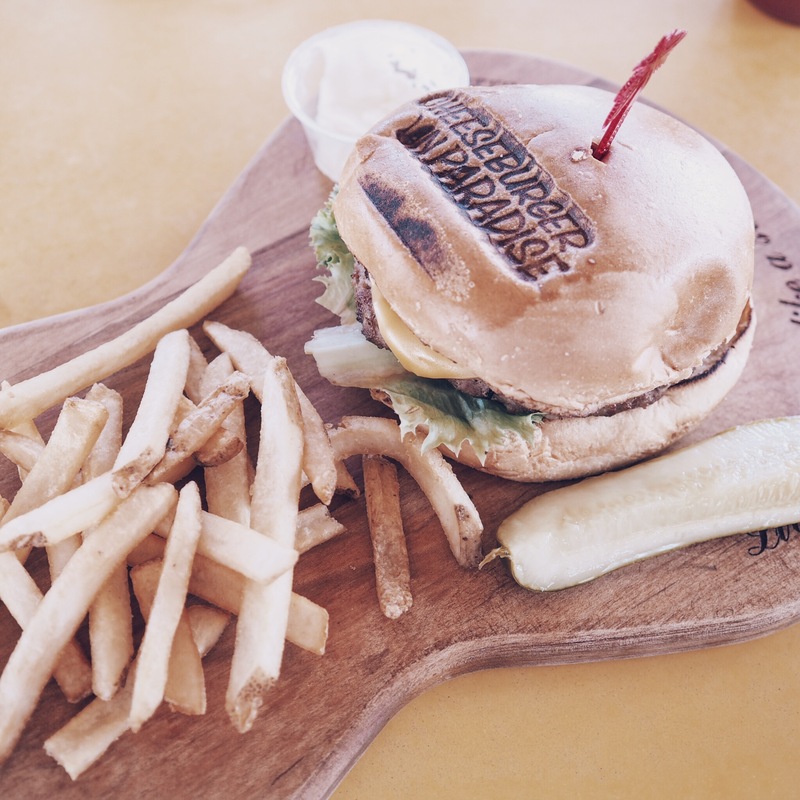 Some of Montego Bay’s food options are open for lunch – some open for dinner – with a mixture of cuisine from all over the world – Caribbean, French, Italian, Asian and a good old English pub. We ate at a different restaurant every night – my favourite being Tokyo Jo’s which was a stir fry restaurant on the waterfront. ACTUALLY no, I change my mind, my favourite meal was a ‘Candlelight Dinner’ which was incredible. It is a private dinner, with options to have in different locations around the resort such as on the beach or jetty or I think in your room! 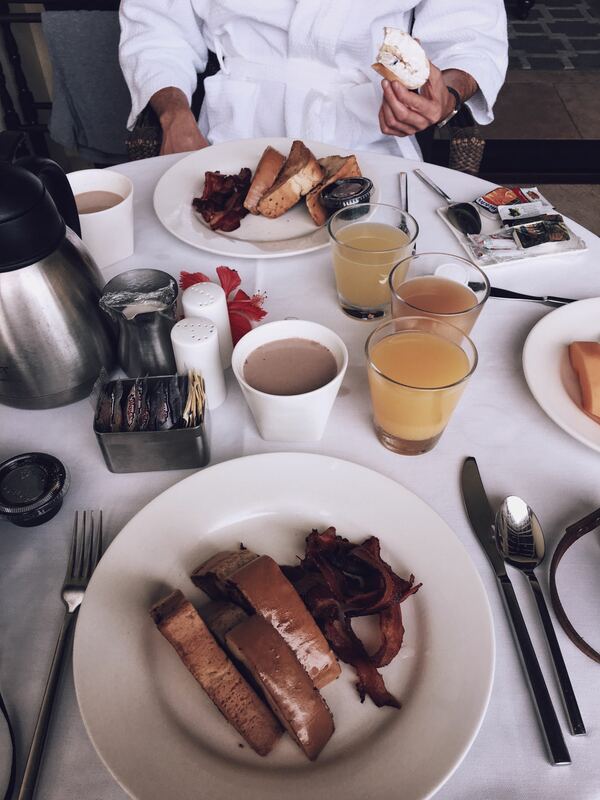 – and the food is amazingggg. 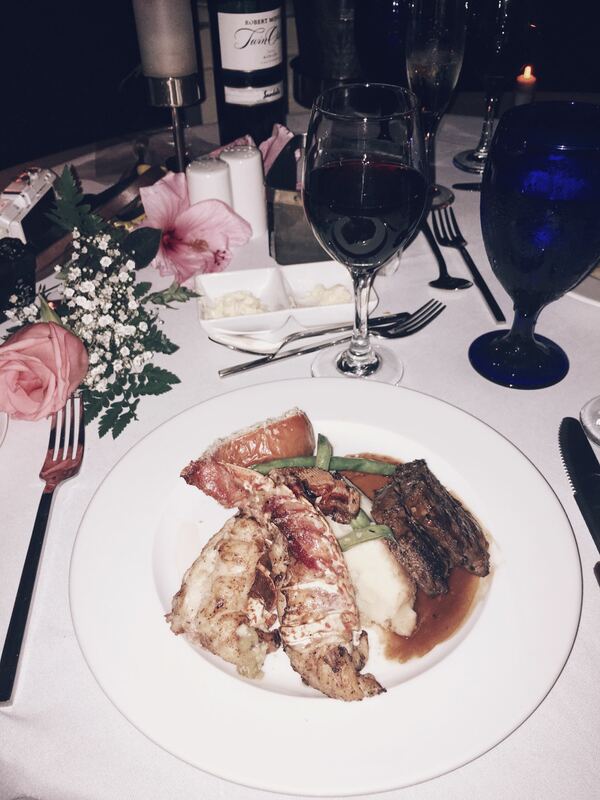 This dinner is an additional extra, rather than included in your stay, but I would say it was well worth it for the romantic experience – and the fooooood! I honestly loved it, our best evening at the resort for sure. Also – anywhere with unlimited ice-cream, burgers, pizza, champagne, cocktails, pastries (from Cafe de Paris which was the cutest little bakery) is THE DREAM. 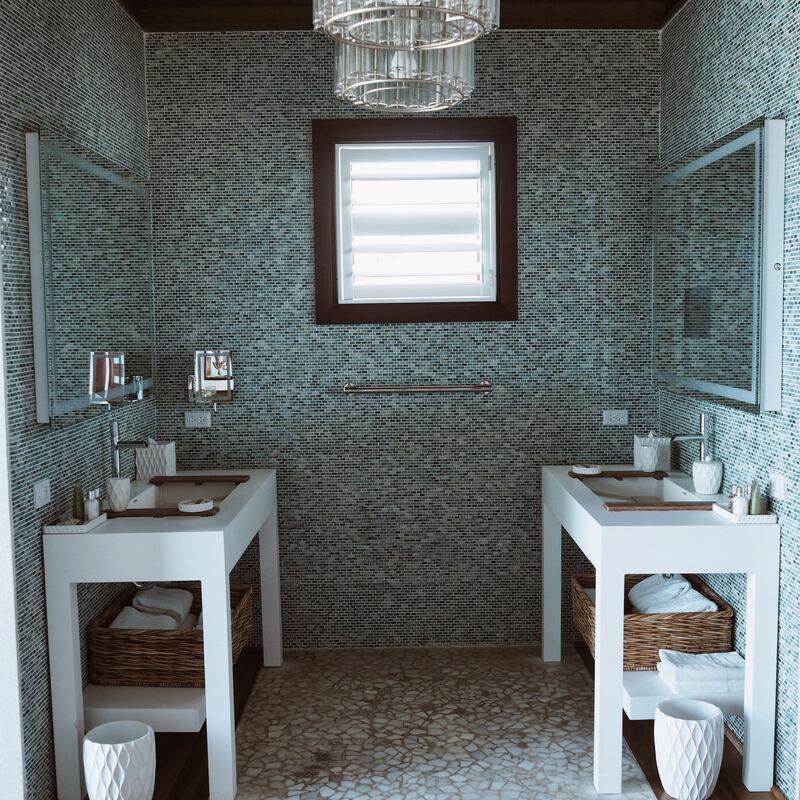 During our stay at Montego Bay – we were treated to a massage, the Raindrop Dreams treatment, at the Red Lane Spa. 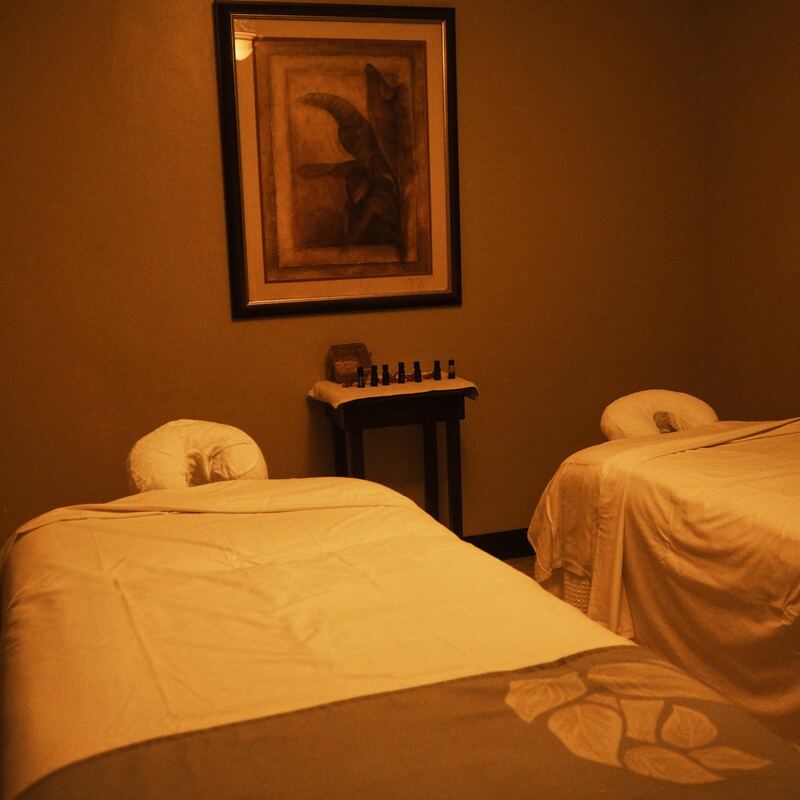 It was a 90 minute full body massage, where 7 different essential oils are dropped down your spine throughout. I always find it so funny when Alex and I are in the same room when having massages as he makes the weirdest sounds. Much to my enjoyment, he had done a big gym workout the day before, so all his muscles were super sore – so throughout the treatment all I could hear was “ooo ouch…ahhhh yep thats where I was doing squats”. Another experience we had during our stay was to spend the day doing an Island Routes Mini Tour. There is a lot of footage of this trip on my Jamaica blog so have a little look at that! 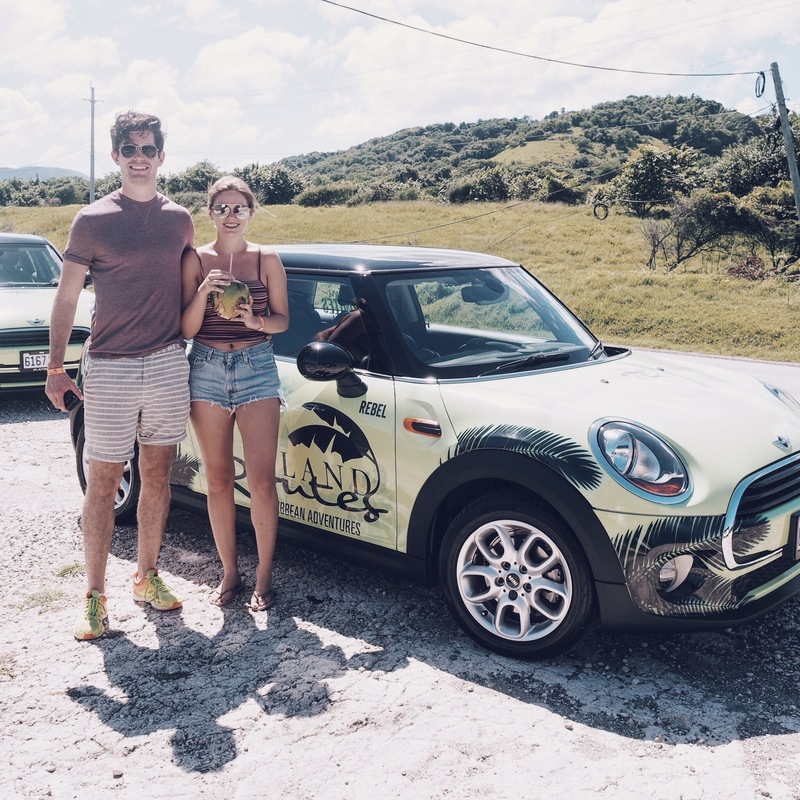 On this day trip (which lasts around 8 hours) you get to drive your own Mini around Jamaica in a sort of Mini convoy, seeing some of the best spots along the way. We stopped off for fresh coconut water, then went to a Margaritaville for lunch for a ‘cheeseburger in paradise’, drove down to see a lighthouse and Rick’s Cafe (it was raining for this part so didn’t get a photo!) and then headed back to the base camp via a Jerk Chicken stop. We all got walkie talkies so you can communicate with everyone in their separate Mini’s, so obviously I had the most fun feeling like I was on a secret mission with my walkie talkie. I would highly recommend this trip for those who want to get out and about, drive around and see the island in a less ‘tour bus’ way- however it is a long time to spend in a car if you did just want to be lying on a beach for a week. It completely depends what sort of holiday and adventure you are looking for. 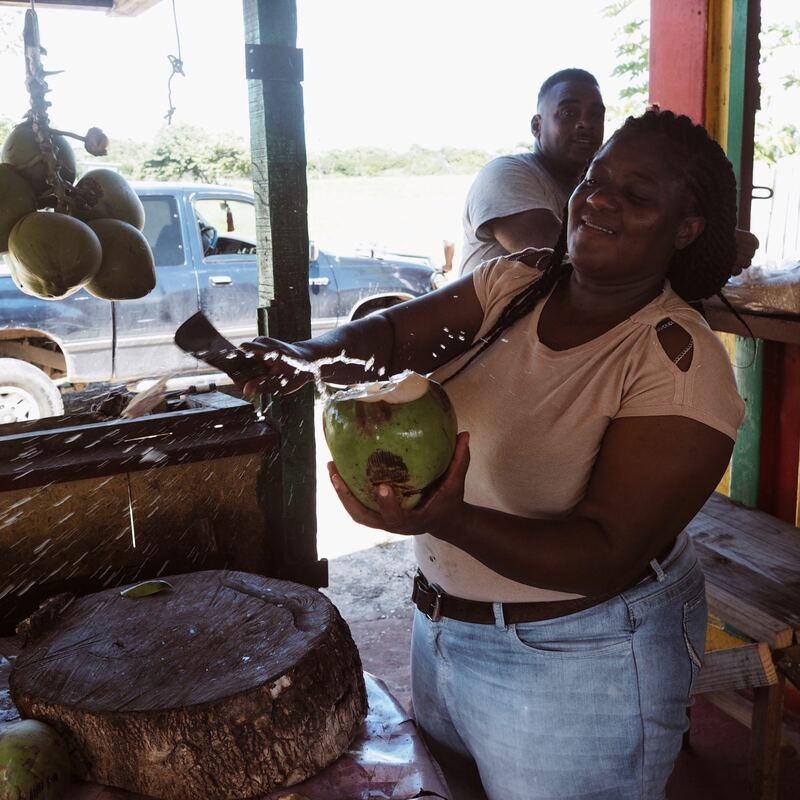 You do get to see great parts of the island, and stop at a few local vendors along the way (best coconut water I have ever had). PLUS you aren’t all crammed onto a tour bus with a guide. Also – it is super fun to drive around in a brand new Mini. My two only issue with the tour was that we ate at Margaritaville – which is great, set on a gorgeous beach, and it is a fun beach club, BUT it is an American restaurant chain (we ate at one in Las Vegas), so I would have much rather eaten at an authentic Jamaican place but thats just me. And also the drive back to the Mini ‘base’ was back along the same road we had been driving along in the morning – so you don’t see anything new on the way back, which is a shame. Other than that – the guide was great, really entertaining and we had a great time singing along in the car to all the Jamaican radio stations. In Montego Bay, we were staying in a Club level room which had its very own Soaking Tub looking over the sea. These baths were hugeeeee egg shaped bath tubs out on the balcony – making them perfect for watching the world go by from the happiness of your own bath (they do also have curtains on the balcony if you wanted some privacy and not having everyone be able to see you in your nice relaxing bath!). Our room was spacious and modern with a HUGE shower and comfy bed! One thing about Montego Bay is that is is right next to the airport, and you could see the planes taking off and coming into land from our bedroom. This is great if you boyfriend is obsessed with watching the planes, but not great for noise levels. But it isn’t Heathrow so the planes are not that frequent. The best part of the accommodation is 100% the soaking tub on the balcony. 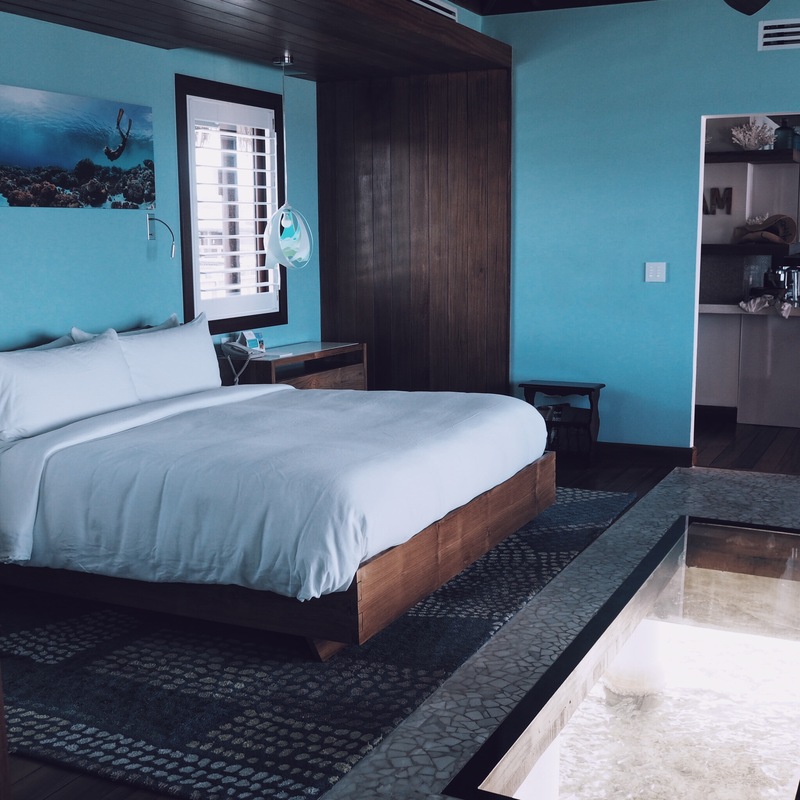 I think MOST of the rooms at Montego Bay have them – there are a few different levels of accommodation, right up to your own butler suite! Half way through the week we moved about 10 mins down the road to the Sandals Royal Caribbean resort – and I have to say, I fell in love with the personality and character of this resort. It felt exactly like what a resort in Jamaica should feel like. We checked into a GORGEOUS room, huge wooden four poster bed, a view overlooking the resort, a jacuzzi bath and sofa area. It was BLISS. Also one of the comfiest beds I had ever stayed in! Whilst we were there we also were treated to a ‘butler service’ where you have your very own butler who you can call (on the mobile phone they give you) if you would like a table booked for dinner, or an activities reserved. 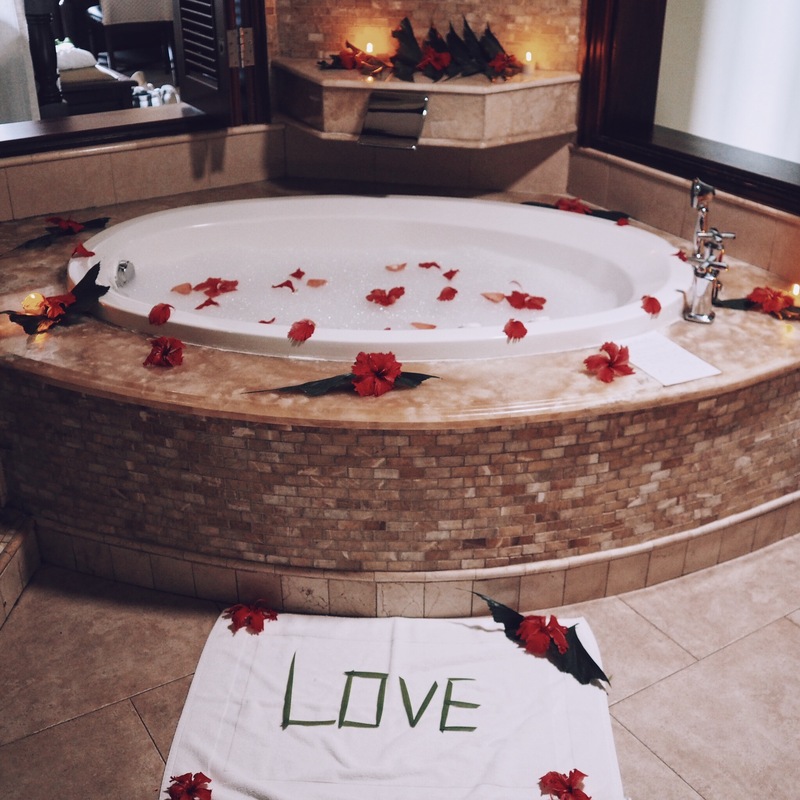 They also completely spolit us with a bath that they ran one day whilst we were out, filled with rose petals and bubbles! The whole resort was just so cool and authentic. They had a much smaller beach than Montego Bay, but they also had sea swings! One day, my life goal is to come back and stay in one of these villas – they are ultimate luxury, incredible service and just a little slice of paradise all to yourself. You can only access this area if you are staying in one of the bungalow or villas so it is completely private and peaceful. 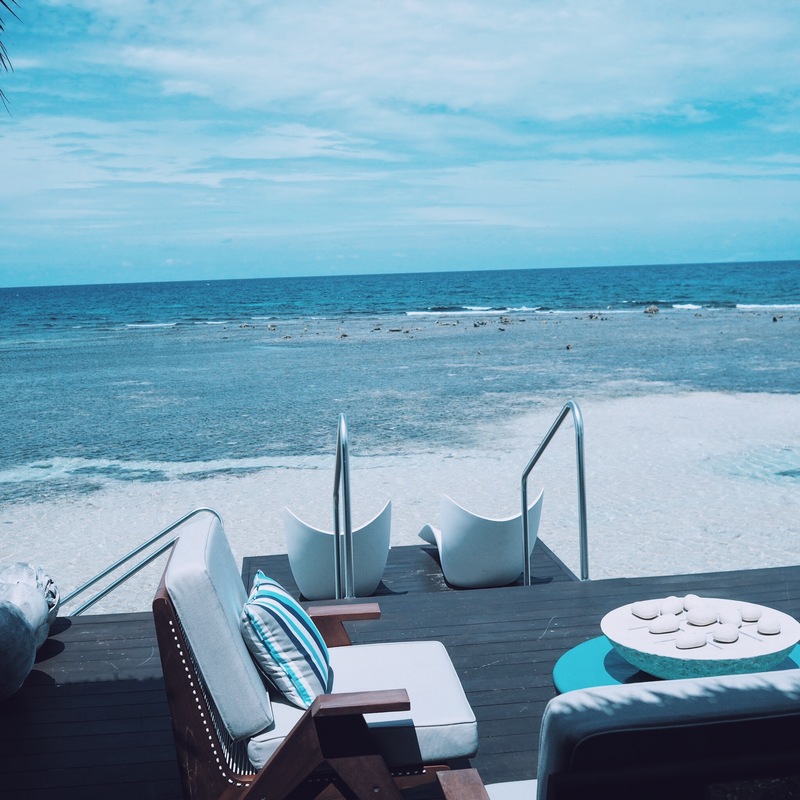 You are surrounded by water, everywhere you look, all the windows, through the floor – you have a private infinity pool and steps down to the sea – utterly heavenly don’t you think! I loved the restaurants at Royal Caribbean as well. 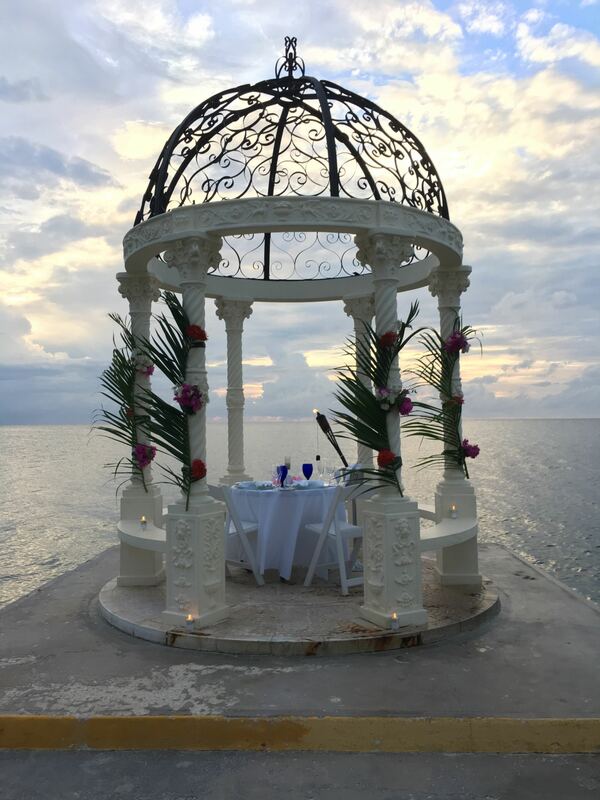 If you are staying at Montego Bay, then you can pop over for lunch and dinner at this resort which I would highly recommend as we had amazing meals at the french restaurant and also The Regency restaurant. Both resorts are great. Within the Sandals brand – there are lots of different resorts, all with completely different personalities. The Jamaican resorts we stayed at, the PR was telling us, have a very laid back, chilled vibe. 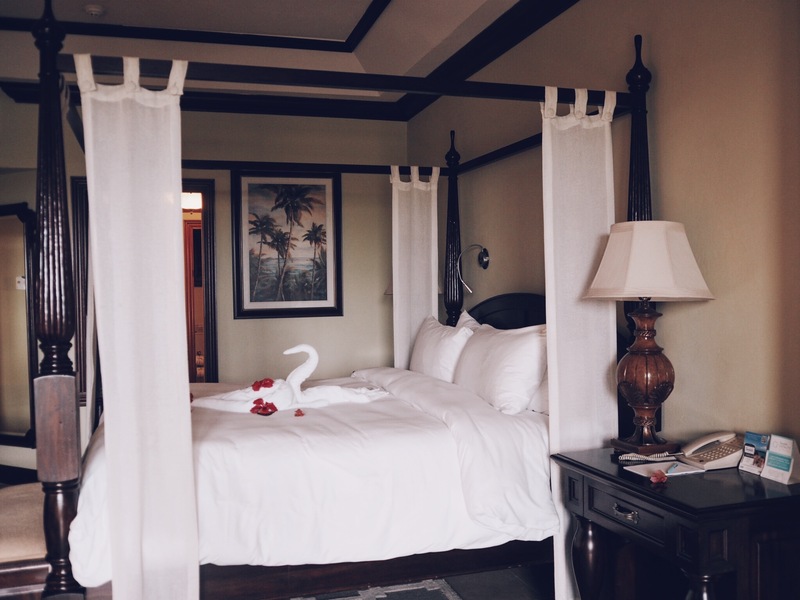 Because these resorts are much more colonial style and authentic, with Montego Bay being here since the beginning, they may not be as shiny and glamorous as some of the other resorts such as Grenada and Barbados etc. but it really depends what you are looking for from the holiday. Each resort has its own personality, as does each guest. If you wanted infinity pools and a brand new modern resort, then this particular resort probably isn’t the right Sandals for you (but do not fear they have MANY resorts that are like this!). It is still fab, of course, and we had the best time – and if you want a much more laid back holiday, with a very authetic Caribbean experience then this is the place. We have done a lot of research since getting home into all the resorts – planning our next trip away and all the resorts look incredible and beautiful. I can’t wait to head off to our next adventure – try and tick off as many Caribbean destinations as possible! I wanted to say a huge thank you to Sandals for hosting us at two of your very special resorts. It was a dream to visit and experience everything the resorts have to offer and I can’t believe how lucky I am that this is my job. I am currently sitting writing this looking out the window at rain and cold outside – and wishing so much that I was back on a swing, in the middle of the sea, waiting for Alex to get back with a cocktail! And to end this post – I just wanted to show you that time that I tried to wear my new bikini and look super cool – but instead I just blended straight into the sofa… perfect match.